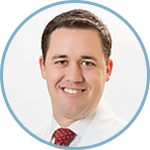 Martyn Knowles, MD, practices vascular surgery at UNC Rex Hospital in Raleigh, North Carolina. He shares his advice for establishing a FEVAR practice in a community setting. What is your practice like in Raleigh? Our group practices at a 650-bed, private hospital in Raleigh that is a part of the University of North Carolina Healthcare system. I have six partners, four vascular surgeons and two vascular medicine specialists. We work closely with the academic vascular surgery group in Chapel Hill and collaborate in education, clinical care, and research. We practice a broad spectrum of vascular surgery with a strong emphasis on peripheral artery disease, aortic disease, venous disease, dialysis access, and DVT/PE management. How did you go about establishing a FEVAR practice at your facility? My interest in FEVAR was developed during residency and fellowship, so I had a clear interest coming in. During training, I had extensive training in FEVAR under Carlos Timaran at UT Southwestern, and honed those skills when I stayed on as a faculty member prior to moving to North Carolina. With an interest and a knowledge base, it was an easy transition once I got to my new practice. An important aspect of successfully setting up a FEVAR practice is either having experience and translating it into your practice or learning ways to absorb it and incorporate it into the practice. As FEVAR was already being done here at our hospital, it was already somewhat set up, but the goal was to try and build the program. The administration and the hospital were on board. What I really focused on was getting the team up to speed and getting them comfortable with the procedures—what devices, what ancillary equipment, and what the patients would need to best carry out the procedures in the most expedient and safe fashion. The goal as always was to provide a safe repair option, with a minimal amount of radiation. The procedure team is a very important aspect of a fenestrated program because you really have to have trust in them and they have to have trust in you. That way, they know exactly what you’re going to need so they’re not running around spending a huge amount of time trying to find everything that you could potentially need. That does come with some experience, and having a discussion with team members prior to the case and subsequently a debrief can help avoid and prevent issues. Specifically, going over the case in depth with the team ahead of time is prudent to anticipate what devices, catheters, wires, and then potentially bail-outs would be needed or available in case there is an issue. The next part was letting everybody in the hospital know that this is something we would be doing. This involved making the ICU intensivists and other physicians comfortable with the care of these patients. Furthermore, we educated physicians out in community from primary care all the way up to vascular surgeons about the procedure. We tried to encourage the vascular surgeons to involve us in the care of some of the patients that had been deemed poor surgical candidates with short neck aneurysms. Why did you feel that it was important to integrate FEVAR into your practice? I think the first and most important aspect of integrating FEVAR is a belief in the platform and the durability of the repair. FEVAR is a safe and effective procedure for these patients. It’s been well-tested, with thousands of implants domestically and internationally, and we know the results are excellent. In my practice, it’s a very successful, safe device for the repair of juxtarenal or short neck aneurysms. The data is clear that these patients don’t do as well with infrarenal repair and FEVAR is an excellent option to the repair, and specifically, using an FDA approved device. Cases that are not candidates for a FEVAR repair are assessed for open repair, or sent to UNC and placed into Dr. Mark Farber’s IDE if they are deemed candidates. We have a collaborative approach to these patients that allows them the most advanced care under a carefully scrutinized program. With that being said, because there’s a belief in knowing that the device performs well, it was an easy thing to want to incorporate. I believe it’s the best thing for the patients. It’s minimally invasive, and often allows them to get back to life without much of a change in their quality of life afterwards. Importantly, we established a set of guidelines for the follow-up of the patients to provide the best care moving forward after repair and to identify any ongoing issues. I do think it’s also important to be efficient in the skills required for FEVAR because fenestrated technology is the first step in the future of vascular surgery. There are so many other devices and improvements upon this platform coming down the pipeline, and if you don’t understand or embrace this, I think you’re going to get left behind as it becomes more complex and more difficult moving forward. Another important component of building a FEVAR practice is that you’re looking for a way to stick out and add something that other physicians in the area don’t do or don’t have experience with. FEVAR can provide you some leadership within the community for the repair of these complex aneurysms. What advice do you have for physicians who want to establish the same type of program? The most crucial parts are creating a team that you trust, and knowing what you’re looking for and what you’re trying to accomplish. I think working on a referral program and involving referring physicians, especially vascular surgeons, in the care of these patients is important. There are a lot of procedures performed, using devices not meant for this pathology with mixed results. Educating those around your area to FEVAR is in the best interest for patients. From an advice standpoint: plan, plan, plan for these cases. For me, that means not just planning the case initially, but making sure you have a plan A, B, C, and D to anticipate the potential problems that may arise. Optimally, I try to think about these cases in so many different ways, and I’ve overthought it to such a degree that I try to eliminate the possibility that there’s anything during the case that’s unexpected. The more cases you see, the more pitfalls and problems you can avoid. Additionally, always thinking about FEVAR allows you to identify a large number of patients who would be outside IFU for an infrarenal repair. Martyn Knowles, MD, is a paid consultant of Cook Medical.